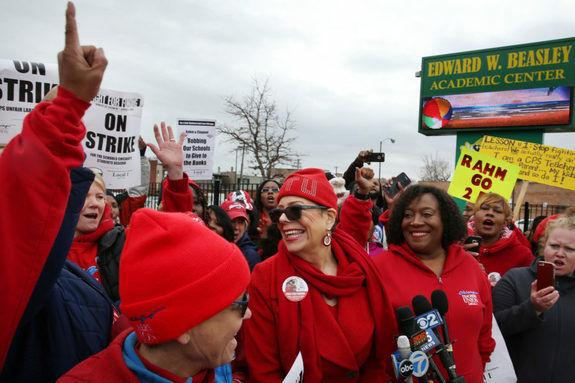 It’s a fraught time for the powerful Chicago teachers’ union, which is entering its first round of contract negotiations in the post-Janus era. As a result of the ruling, school districts can no longer require their employees to pay negotiating fees to the unions that bargain on their behalf. Observers predict a decline in union membership and dues, which would limit the unions’ political power. The union also has been facing a budget deficit and pressure to afford rent payments on both a new building on the Near West Side and its previous space, which it has not been able to sublet. Lewis urged membership to continue to channel their energy into “a collective power,” going into negotiations. The contract isn’t up until June of next year, but the leadership hopes to put pressure on Mayor Rahm Emanuel in advance of the mayoral election in February. Read Lewis’s full letter to teachers below. This week begins the new school year. May you each find success and new energy as you return to your classrooms and the profession you love. As our new year begins, it is a time for us to renew our commitment to fighting for the schools our students and teachers deserve. Let us return to our Chicago Public Schools (CPS) classrooms with a renewed strength, laser focus and open hearts as we welcome our colleagues and students in this new season of growth and change. As you know, I recently retired from CPS and therefore have resigned from my position as president of the Chicago Teachers Union. It has been a tremendous honor and privilege to serve in a leadership capacity and to join each of you on the battlefield for justice and equity in public education. The decision to end my tenure was one that weighed heavily upon me and was done in consultation with my husband, family, friends and colleagues. Since taking office in 2010, this has been a constant fight against powerful forces and their myriad of allies that seek to destroy collective bargaining and rob our children of their futures. Yet, as great of an enemy as this system has been, I had no way of knowing that all of this was preparing me for the biggest foe of them all. Yet, I am not afraid. With any fight, clear vision and bravery are prerequisites of struggle. While I continue to restore my health, I encourage each of you to channel your energy into a collective power that moves our union forward and guarantees the wins we’ve secured—and the campaigns we have started will continue until every child has every resource needed to be successful. In my fight against brain cancer, I am reminded through my faith that when storms come, the brave do not jump overboard. They do not abandon ship, nor do they panic. Even if the captain is down and storm clouds are gathering, the rest of the crew must steer the ship on its charted course. As you enter your building, remember: We have a contract fight on our hands—and the racist, misogynistic, homophobic and elitist voices remain strong. Our enemies are banking on this transition in CTU leadership to confuse, conflate and co-opt our union. Do not let them. Transitions are not meant to be easy. Change never is. However, I have worked side-by-side with Vice President Jesse Sharkey, who has assumed my responsibilities as president as laid out in the CTU Constitution, beginning when I was first diagnosed in 2014. Under his consistent leadership, the CTU will remain a focused, fighting union that protects the interests of its members and those we serve. Any presidency can only be as strong as the rest of its leadership team. Continuity is important. That is why officers Michael Brunson and Maria Moreno remain valuable in their current roles of recording secretary and financial secretary in this administration. As Jesse’s role as president is formalized, the vice presidency now becomes vacant, and it is my hope that members will value the addition of CTU Political Director Stacy Davis Gates in that role. Through our organizing, legislative and political efforts, the CTU has restored the pension levy, stopped the spread of non-unionized charter operations, and launched political campaigns that have sent educators Sue Garza, Brandon Johnson and Aaron Ortiz to public office. The CTU worked to reduce CPS’s gaping budget deficit, won back hundreds of millions of dollars from the mayor’s TIF slush fund, and fought off mismanagement and bank deals, charter companies and corruption. We successfully negotiated more than $10 MILLION for sustainable neighborhood public schools. Our political, organizing and communications model has been adopted by other labor organizations across the nation. Even with these significant wins, there is still much more work to do. Let us channel our victories into renewed campaigns to ensure our careers are not threatened and that Chicago has an elected, representative school board. Wages, benefits, and safe and collaborative working conditions are important to all of us and central to every contract campaign. But in a city rife with unemployment, poverty, and violence, so is ensuring that every student has access to a librarian, counselor, social worker, nurse, special education professional and the support services they need. As I focus my attention on this next chapter of my life, I want each of you to remember that the detractors, naysayers and union busters will come. They will seek to take advantage of this moment in order to entice you to act against your own self-interests. However, if their offer does not make us stronger, if it doesn’t unite us, and doesn’t move our cause forward, then we must turn a blind eye to their schemes and keep our eyes on the prize. CPS may always be a hot mess, but with our due diligence, creativity, expertise and insights we can one day make this the strongest school district in the nation. Thank you all for your well-wishes, thoughts, and prayers. I love you all and I will see you soon.